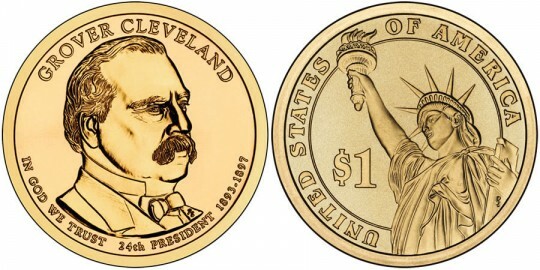 The 2012 Grover Cleveland (Second Term) Presidential $1 Coin will be released by the US Mint as the final of four 2012-dated strikes of the Presidential $1 Coin series. The obverse of the coin will contain a portrait of Grover Cleveland representative of his second non-consecutive term as the President of the United States which ran from 1893-1897. Cleveland had previously been President from 1885-1889 and was honored on a separate Presidential $1 Coin acknowledging that first term. All of the coins of the series are struck by the US Mint and released at a rate of four per year beginning with the inaugural year releases in 2007. The release order of the coins is dictated by the order in which the individuals served with the program scheduled to run until all qualified individuals have been included in the series. Grover Cleveland won his second non-consecutive term as President which began in 1893 after being a private citizen for four years. Unfortunately, the term was fraught with challenges such as the Panic of 1893 which led to an economic depression in the United States. He also underwent surgery in private to remove possible cancerous tissues. The obverse of the coin contains a portrait of Grover Cleveland representative of his second term as President. Inscriptions on the obverse include "GROVER CLEVELAND," "24TH PRESIDENT," "1893-1897" and "IN GOD WE TRUST." Don Everhart's depiction of the Statue of Liberty is featured on the reverse of all Presidential $1 Coins. It is shown along with the inscriptions of "UNITED STATES OF AMERICA" and "$1." Inscribed on the edge of each coin is "2012," "E PLURIBUS UNUM" and the mint mark.